This small market remained stable in 2012 with 174.000 units. VW Group dominates with 44% of total sales thanks to Skoda, the local brand. Hyundai Motor performs very good with 14% share thanks to the latest products coming from Central Europe (it was the group with the best performance among major car makers). Then comes the 4 troubled European car makers: Renault, Ford, PSA, and GM, all with falls. 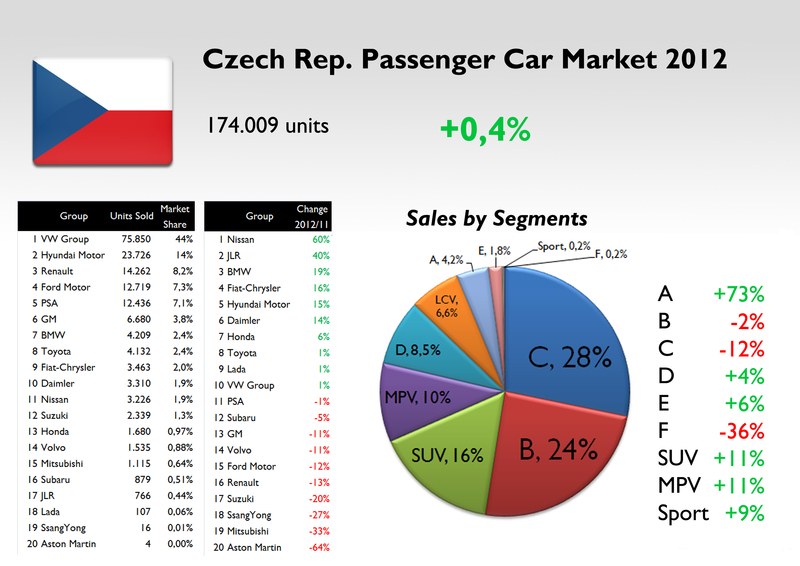 28% of total sales correspond to C-Segment cars, down 12% (the Octavia is the main reason for this result). Then comes B-Segment where the Skoda Fabia rules. Third place is occupied by SUVs, which counted for 16% of sales. A-Segment had a big jump, up 73%, thanks to the arrival of the Skoda Citigo, which immediately after its introduction, dominated the segment. C-SUV segment was up 24%, and counts for 62% of SUV total sales. And MPV segment was up 11% even though Skoda doesn’t offer any MPV yet. Fiat-Chrysler is really weak in this market with 2% market share and 3.463 units sold. 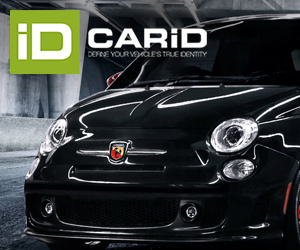 Last year the group increased its registrations by 16%, thanks to Fiat, Jeep, and Lancia. 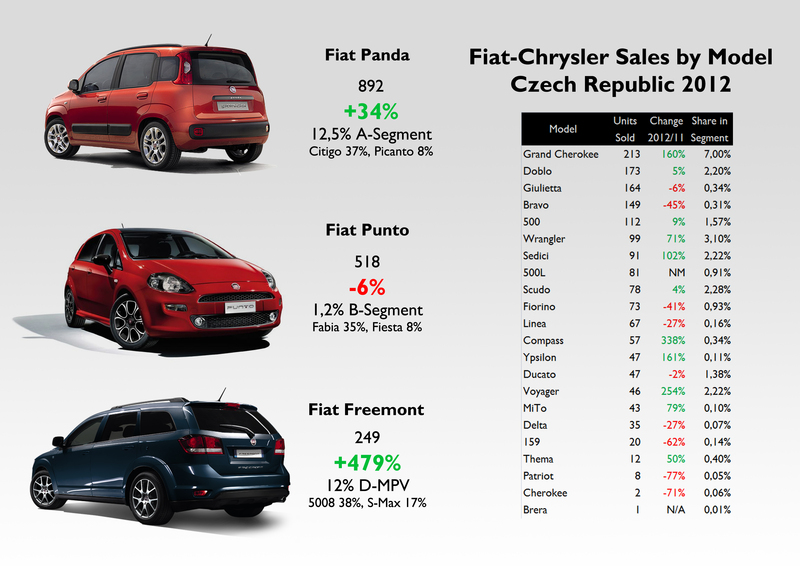 Fiat increased its sales thanks to the new Panda, and surprisingly, to the Freemont, which was the third best-selling car of the group in this country. Contrary to what happens in the rest of Europe, the 500 isn’t popular at all, and even the Bravo outsold the popular mini car. 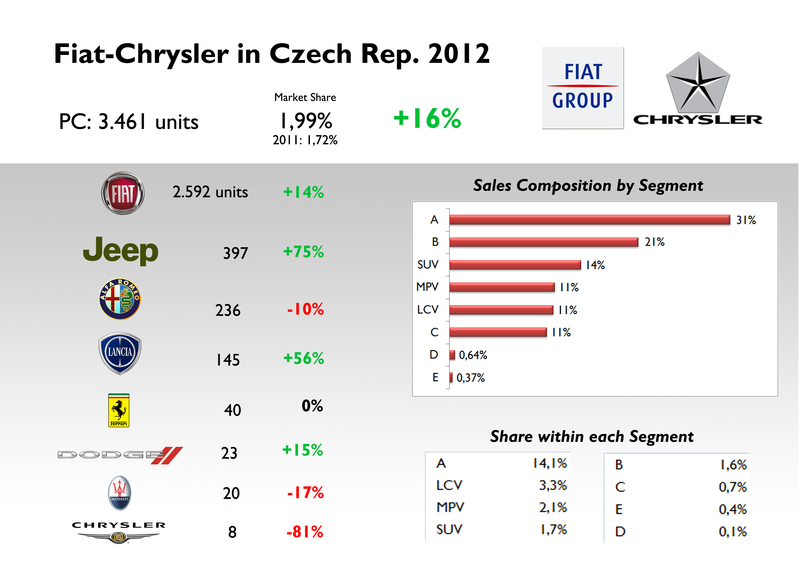 Another surprise is the great position of the Grand Cherokee, with 213 units, up 160%. The unpopularity of the 500 allows the group to have a good balance of its sales by segments, with A-Segment ranking first with only 31% of total sales, and closely followed by B-Segment with 21%. SUV, MPV, LCV, and C-Segment have all similar shares. The Panda controls 13% of A-Segment, and is followed by the Freemont, with 12% of D-MPV segment. In 2013 the group could rise its registrations to 3.600-3.700 units with the arrival of the 500L and the restyling of the Grand Cherokee.